This Bowl of Soup Will Really Warm You Up! I love being able to toss a handful of ingredients in a slow cooker and know that in 5 hours we will have an amazing soup ready to eat. This is the kind of meal I love putting together during the week when it feels like you are running out of time and the last thing you want to do is make a meal and clean up a mess! I mean, sure you will have to deal with the empty cans but I can totally handle that! Ree Drummond always pulls together the easiest meals that are bursting with flavor! And this is one soup that does not disappoint! Ree knows that having a family dinner together is important and being able to take the frazzled mess out of meal planning is a huge benefit. I love that this recipe can be made while you are out and about, but in a pinch, you can always make this on the stove top in a Dutch oven and let it simmer for a while. Since this recipe makes 12 servings you can count on having leftovers to take for lunch, or enjoy another meal! This is what Ree says about her recipe. 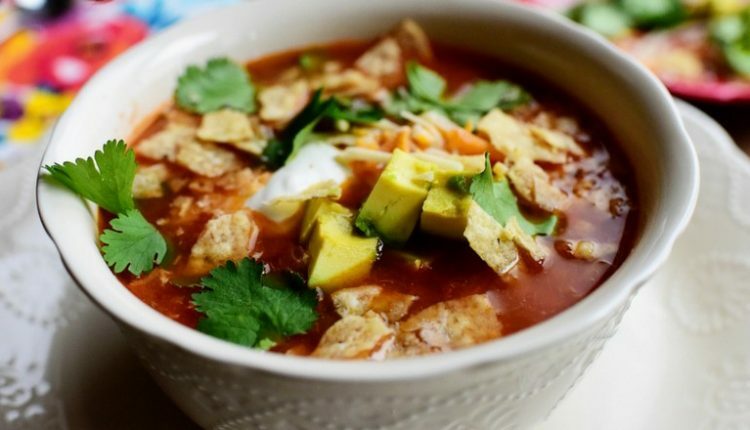 Quick Tip: Make some cheese quesadillas to serve with this soup. You Might Want to Bake a Double Batch Because One Bite And They will BE GONE!